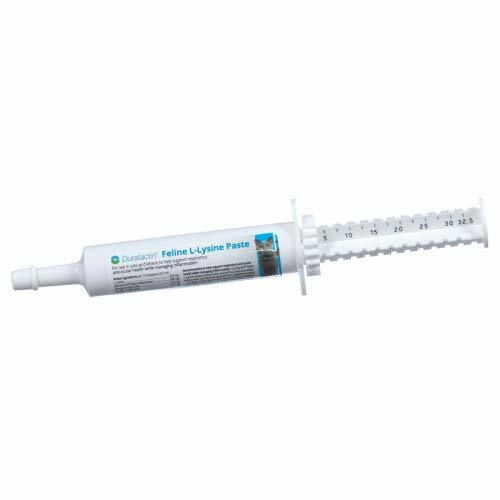 Duralactin Feline L-lysine is a highly palatable paste preferred by both healthy cats and cats in isolation for respiratory signs. Give directly or mix with food. Each syringe is notched and marked for individual dose. One syringe will treat one cat twice a day for a week. Usually need 2 to 3 syringes per cat for treatment. Results seen in 4-7 days with peak effects in 10-14 days. Does not suppress immune system. 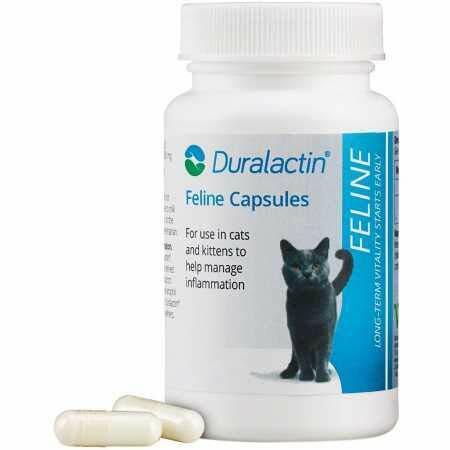 Duralactin Feline is intended to be used as a nutritional aid for the management of chronic inflammatory conditions including musculoskeletal disorders. 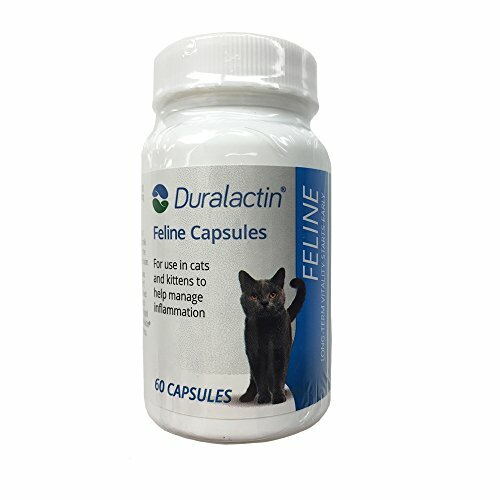 Duralactin Feline contains MicroLactin a patented milk protein concentrate derived from hyper immunized cows that contains factors that appear to inhibit neutrophil participation in the inflammatory response. 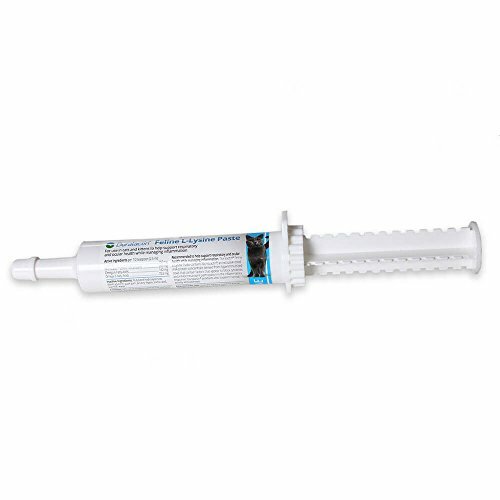 For the immuno-nutritional management of chronic inflammatory conditions in cats. Active ingredient, MicroLactin (dried milk protein) contains factors that inhibit cellular (neutrophil) participation in the inflammatory response. Helps manage chronic inflammatory conditions in 4-7 days with peak effects in 10-14 days. Ideal long term adjunct to glucosamine chrondroitin nutraceuticals or prescription NSAIDs. For cats weighing 12 lbs. or less, 1 teaspoon (5 ml) twice daily. Each teaspoon contains 200 mg of MicroLactin, 198 mg omega 6 fatty acids and 90 mg omega 3 fatty acids. For cats weighing more than 12 lbs., the dose is 3 teaspoons a day split between morning and night. Each bottle is expected to treat 1 average weight cat twice a day for 24 days. 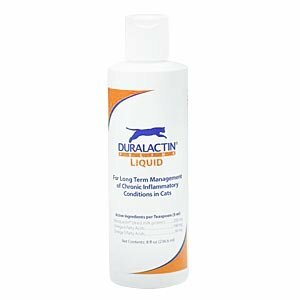 Duralactin is a safe and effective supplement to be used for long term management of inflammatory conditions in cats and kittens. Duralactin is unique in the fact that it can be used for many different types of inflammation. Great for aging cats or cats that cannot take other supplements or are not responding to other supplement. Duralactin does not require an initial dosing period, but rather works right away, making it more cost effective and makes you feel better by getting your cat help right away. Also, there are no side effects associated with Duralactin. Duralactin inhibits the neutrophil migration, which is an alternative approach to managing pain. 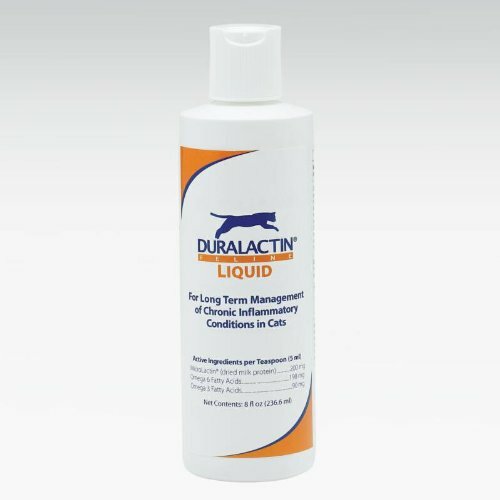 Feel good about giving Dualaction for your cat's pain management. Joint Supplements, A novel approach using dried milk protein to help manage chronic inflammatory conditions including osteoarthritis and soft tissue injury. Chewable vanilla flavored tablets.